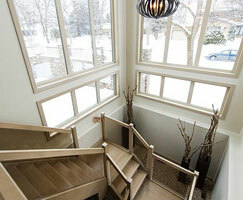 We can help design and create a unique custom stair that will be the focal point of your home! Our most popular stair for residential, commercial, and multi-family projects is designed and built to accept numerous flooring products. We are not just limited to stairs! With our design and carpentry capabilities we can create any wood-related projects you can think of! 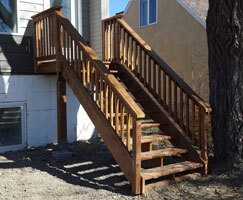 In addition to exterior stairs, we offer complete deck and fence packages, sheds, etc. 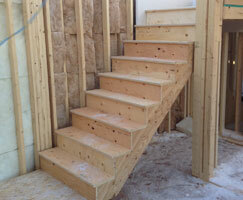 Treads by Design is a stair manufacturing company located in Winnipeg, Manitoba. We specialize in pre-fit, pre-assembled, custom and production staircase systems working primarily with large reputable builders throughout Winnipeg and the surrounding areas. 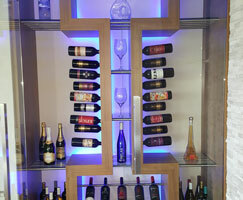 We are committed to providing our clients and customers with exceptional quality by ensuring the highest industry standards and product installation techniques are being utilized on every project. Our stair design capabilities and procedures are well established and have been instrumental in our success. We utilize the latest computerized technologies to design and to manufacture our quality stair products. In an effort to save our builders time and money, our stairs are often pre-assembled in a shop controlled environment to ensure quality and consistency. Treads by Design prides itself in establishing long term relationships with our clients and customers. We supply thousands of staircases for home builders, commercial general contractors and private builders throughout Manitoba, Saskatchewan and Ontario and we would love to work with you on your next project. Please contact us today for more information. We look forward to earning your business.